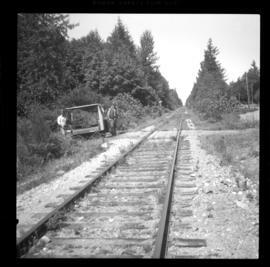 Photograph taken at about 11 miles north of Parksville on the Alberni branch. 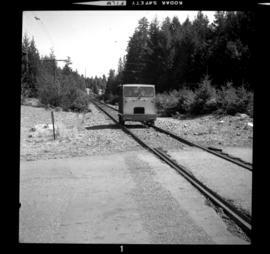 Image captures the entrance to the Little Qualicum provincial government camp site. Photograph taken on mile 105. 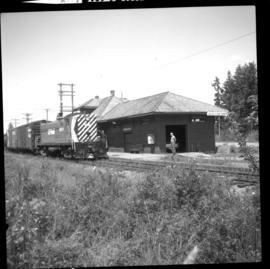 Image captures people waiting for the daily passenger train. The location is between Qualicum Beach and Dunsmuir. 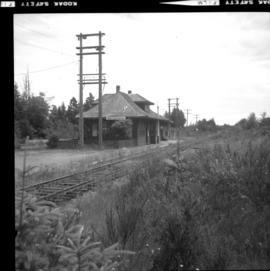 Photograph taken at the Qualicum Beach depot which was not in use at the time the photograph was captured. Twice a week freight passed between Parksville and Courtenay. 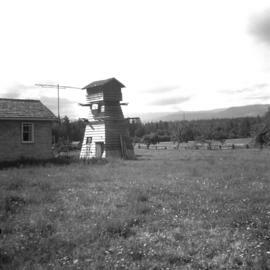 Photograph depicts a pump house on the Island Highway, north of Qualicum Beach, Vancouver Island.